That was my first reaction when I was offered the opportunity to attend a SUP Yoga class held by London SUP Open. My second reaction was I need to try it now! So I joined a group of fellow bloggers including world record holding pro paddleboarder Lizzie Carr at the Islington Boat Club in London. I haven’t had the best experiences in the water, I have fallen out of kayaks and canoes so I guess it was time to change my mindset. 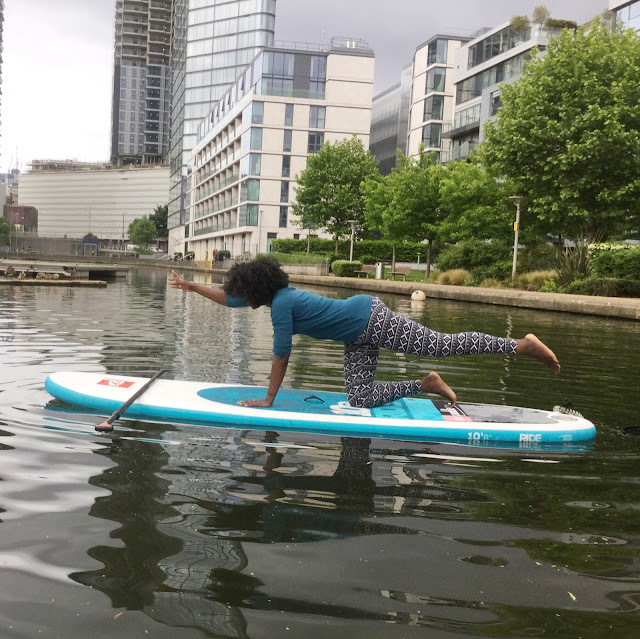 SUP Yoga also known as Stand up Paddleboard Yoga has seen a surge in popularity in recent years, due to the increased accessibility of SUP yoga and SUP classes. London SUP Open consists of an international stand-up paddle board competition which takes place in London for the first time on 7th and 8th July 2018. It will be a free weekend of pro and amateur events,wellness and family fun. Not only will the biggest names in international SUP be descending on the capital but a huge mass participation race will be taking place. Children and adults alike can register online to participate in the race. No equipment is needed as it can all be hired at The Open. The class took place at Islington Boat club where our instructor Rosie briefed us with all appropriate information needed before we left the ground. She assured us that we would be fine if we follow protocol and that she would be there for us if we needed any help. You guessed it I really needed her help. As I was scared to get on to the paddleboard at first but once I saw everyone else around me giving it a try. I decided to be brave and I gave it a try, I got onto the paddleboard, got into the starting position and began to paddle. One of my fellow bloggers helped to calm me down by strapping my board on to the line (pole ! I can’t remember what it is called) . Then the class began, we started with some breathing, then some stretches before we moved on to the asanas which helped me to relax. Then we moved on to poses which included the bridge and downward dog. 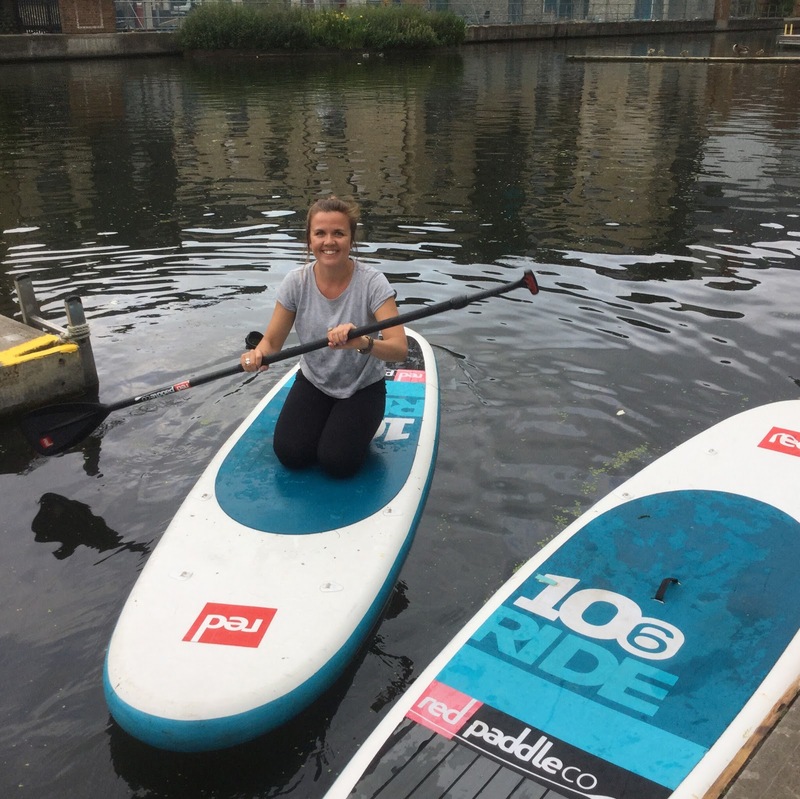 Lizzie is a London SUP Open ambassador and blogger. Who also participated in the class where she showed us how to do a headstand with perfect form on a paddleboard (above). Lizzie was also the first woman to cross the channel on a paddleboard and she is the founder of Plastic Patrol. Who organise clean up events which offers participants the opportunity to try paddleboarding for free. I really enjoyed the session I left feeling calm and relaxed. Even though I initially had some issues I left feeling stronger and more knowledge about yoga in general. I had an issue with staying in place whilst paddling especially when I had to change positions. As I did have some trouble balancing at first but once Rosie reminded me to breathe and hold my core. I remembered that I was in a yoga class and that really helped. I believe that everyone should try SUP Yoga as it is beginner friendly and we need to feel more confident in the water. So if you can swim you have no excuse and should give it a try if you are interested. Have you tried SUP or SUP Yoga let me know in the comments. This is such a great sup yoga review. I have pleased to read your storylines on sup yoga. Those pictures are rocking and inspirational too. Rosie looks amazing on the paddle board. I am very much excited to take a session very soon. Also, it is great to know about international stand-up paddle board competition. Is there any news for this year? I am very eagerly waiting. It looks very cheerful to see Lizzie. By the way, I am waiting to read more things like this. Thanks and I am going to share this on my social media pages to see my friends and followers. 3 WAYS TO CREATE A POSITIVE START TO THE NEW YEAR. Make Eat Repeat 2017. Simple theme. Powered by Blogger.